There are many fine physical fitness programs today that will help you break a sweat and give your body a physical workout. Okay, so what IS Christian Fitness? Do you sometimes have an impression or clear “word” from the Lord upon awakening? Sometimes it may be a song of praise or a scripture. “In the beginning was the Word, and the Word was with God, and the Word was God. And the Word became flesh and dwelt among us” (John 1:1 and 14). Praying and meditating on those words, I wrote the following, and I believe they will be a blessing to you, by God's grace, as they have been to me. For fitness to be “Christian,” it must involve Christ in some way: our relationship with Him, meditation on His Word, praising Him; in other words, focusing on Him during points of our workout. We may not focus on Him at ALL times because we want to make sure our form is correct physically, but we turn to Him and “tune-in” to Him at various times during our workout. 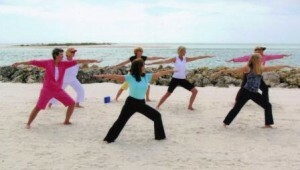 What makes a workout or exercise class “Christian Fitness”? Christian Fitness is not “Christian” because a believer in the Lord Jesus Christ happens to be the one exercising, or because we call our class “Christian,” or even because we play Gospel music while working out. Question: Well, what makes a person a Christian? Answer: Their RELATIONSHIP with Jesus Christ. Question: What makes your workout “Christian fitness”? Answer: Your RELATIONSHIP to Jesus Christ during your workout. How Can You Honor the Lord during Your Workout? * Praise the Lord! 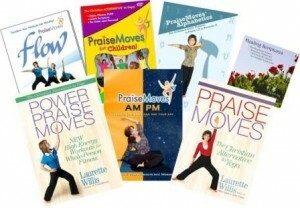 Listen to praise music while working out — and then actually praise and thank Him! * Meditate on a promise of God from Scripture while you work out such as: “I can do ALL things through Christ who strengthens me!” (Phil. 4:13); or “(I'm) strong in the Lord and in the power of His might!” (Eph. 6:10); or “Christ the power of God and the wisdom of God” (1 Cor. 1:24); or any others you'd like to make a “part” of you. * Read your Bible or a devotional book while on the elliptical, exercise bike or treadmill. * Listen to or watch good Bible teaching while working out (a friend of mine has a morning appointment with a television Bible teacher every morning at 8AM on her treadmill!). * Declare God's Promises! Power Promises 4-part Walking Workout is instantly downloadable for your mp3 player, smart phone or burn a CD to play while on the elliptical or take for a brisk walk – and declare the promises of God! * Pray for others while working out. Lift them up to the Lord while lifting weights! * Make scriptural declarations and personalized scriptural affirmations while working out. Hearing your own voice say the truths of God's Word and taking them personally is powerful! * Take a prayer-and-praise walk in your neighborhood. Walk 15-20 minutes in one direction praying for the needs of our nation, the peace of Jerusalem and the needs of your family and loved ones. Turn around and for the next 15-20 minutes, praise and thank the Lord for answered prayer on your way home. It works!!! * Name a few of your own! Would you like to experience Christian Fitness? Easy! Just make sure your workout involves the WORD of God in some way. Remember: “In the beginning was the Word, and the Word was with God, and the Word was God. And the Word became flesh and dwelt among us” (John 1:1 and 14). Please COMMENT on what you do as “Christian Fitness” — I'd love to know!!! 5 Responses to "What IS Christian Fitness?" I had never heard of this until a neighbor told me she’s been doing it with her kids and really enjoying it. One of her kids in particular is extremely hyperactive and she said this program is really helping to improve his ability to stay calm and focused during the day. I too had not heard of this until I saw it on Facebook. A few of my friends are doing it and loving the whole thing. I may have to try it after reading this 😀 If it will help my anxiety I am all in! Honoring the King and working out! Awesome Program! Please contact me about being a health coach. I am Magaly’s husband. Thanks, Jeff.